Summary: Language is one of the major ways in which culture is manifested. One can only get inside a culture if one is able to speak, read or write in its language. The earlier one starts to learn a language, the easier it will be. In this context, children from bi-national families are not consciously learning a second language but have to face the two cultures and the two languages of their parents simultaneously and unconsciously from birth. Therefore, it would seem that children from bi-national families have the best opportunity to master the two languages. This article focuses on the way parents from ten German-Chinese families living in Germany or China deal with this issue. Резюме: Язык является одним из важнейших факторов, в которых проявляется культура. Человек может проникнуть в культуру лишь тогда, когда он может говорить на языке, читать и писать. Чем раньше начинают изучать язык, тем проще. В этой связи дети из семей с родителями двух национальностей учат второй язык неосознанно, с самого рождения они одновременно и неосознанно соприкасаются с двумя культурами и двумя языками своих родителей. Поэтому кажется, что дети из семей с родителями двух национальностей имеют наилучшие возможности овладеть двумя языками. Данная статья в основном рассматривает то, как родители из десяти немецко-китайских семей, которые живут в Германии или в Китае, решают данный вопрос. Zusammenfassung: Die Sprache ist eines der wesentlichen Faktoren, in denen sich die Kultur manifestiert. Man kann eine Kultur nur verinnerlichen, wenn man die Sprache verstehen, sprechen, lesen, und schreiben kann. Je früher man eine Sprache lernt, umso einfacher ist es.Kinder aus bi-nationalen Familien lernen eine Zweitsprache nicht bewusst, müssen sich aber mit den beiden Kulturen und beiden Sprachen der Eltern gelichzeitig und unbewusst von Geburt an auseinandersetzen. Daher scheint es, dass Kinder aus bi-nationalen Familien die besten Gelegenheiten haben, zwei Sprachen zu meistern. Dieser Artikel behandelt hauptsächlich, wie Eltern von zehn Deutsch-Chinesischen Familien, die in Deutschland oder China leben, sich mit dieser Frage auseinandersetzen. Der Artikel schließt mit einem Vergleich und einer Analyse der Haltungen und Gewohnheiten der Eltern sowie der Leistungen der Kinder aus diesen zwei Ländern. For years, the number of bi-national families as well as their children has been increasing in Germany. In 2012, 10.63% of children born in Germany were born to couples in which only one of the parents was a German national (Verband binationaler Familien und Partnerschaften e.V.) (http://www.verband-binationaler.de/index.php?id=3). This tendency has also been noted by Chinese scholars. Moreover, German-Chinese relationships can always be found in bi-national love matches in these two countries. As a matter of fact, German-Chinese marriages were already to be seen in the 1940s. “My German wife and I were going to a café which was close to the town hall. At that time, Germany already showed signs of losing the war. There had to be a blackout at night” (Qiu, 2006, p. 205). Qiu, a renowned surgeon, gained his PhD at the University of Munich in the late 1930s and still remembered well his ten-year studies, research and life in Germany. This phenomenon continued as marriages between Chinese men from the gastronomy sector and German women were not unusual in the 1950s and 1960s (cf. Flemming & Liang, 2007, p. 443 f.). Although any bi-national relationships have their specific positive sides that mono-cultural families do not have, e.g. broadening of horizons in a different culture, the big, even huge, cultural differences are likely to be a great challenge for the couples to face. Moreover, the couple´s approach to negotiating cultural values will have a strong impact on their children. To be more precise, what are the goals of parenting within a bi-national relationship? What characteristics would they like to pass on to their offspring? Do they think that bilingual education is important and do they use both languages with their children regularly? In fact, not only the parents have to think about these questions, but children are also fully involved in the process of negotiating cultural values in bi-national families. Research on migration, however, has been mostly limited to immigrants as individuals rather than as members of a family. Nevertheless, some books have been published and a certain amount of research has been conducted on child-rearing in bi-national families in which one of the parents is Chinese. Long (2008), for instance, shared her own story of being a mother and of how she had to deal with her children, who caused her to rethink her traditional way of parenting in a bi-national family. It was no coincidence that Long was equally confronted with the issue of bilingual education. “Ann ´s mom is Chinese. She has spoken only Chinese to him since right after he was born. Ann´s dad is German and speaks standard German. Ann speaks to him in German, but the parents communicate in English with each other. No one teaches Ann English” (ibid: pp. 18f.). Schwantes (2009) conducted her scientific research on the cultural identities of children from German-Taiwanese families. Based on interviews with 17 Taiwanese parents and some of their children living in the German city of Munich, Schwantes pointed out that not all these families were making efforts to promote the use of both languages equally. From her point of view, teaching a language had something to do with feeling, hope and fear. In order to manage bilingual education in the family, she suggested following the rule: one person – one language. Namely, each parent speaks only his or her mother tongue to the child (Schwantes, 2009, pp. 94-97). In this research it was also highlighted that if the parents could understand their partner´s language, especially those languages which are difficult to learn, it would be very helpful for their children. In this context, Chua (2011), the “tiger mother”, firmly stuck to her Chinese way of parenting her children although she was already the second generation of migrants in her family. “The girls barely had time as it was to do their homework, speak Chinese with their tutor, and practice their instruments” (p. 97). Even if Chua´s book is not an academic study, her experience does indeed call attention to a number of aspects which clearly contrast Eastern and Western styles of parenting in general as well as Chinese and American styles in particular. More currently, Wang (2012) conducted research on German-Chinese families, some of which live in Germany and some in China. The aim of this research was to get all the parents actively involved in this study in order to compare their different parenting styles in a larger social context. One of the findings refuted the hypothesis that children from bi-national families would have the best opportunity to master the languages of their parents. On the contrary, only some of the children from the ten families have managed it. Some, however, speak only one of their parents’ languages, in most cases, this is German. Why was this the case? A closer analysis of the circumstances and factors provides some answers. The five German-Chinese families were living in Munich, Dachau, Pulheim and Clausthal-Zellerfeld, which are located in different Federal States. In addition to the five sets of parents, altogether seven children aged from two to eleven participated in this research. In order to compare the parents´ attitudes and their implementation in their children´s bilingual education, their feedback is presented separately. The wish to provide a bilingual education for their children was shared by all the German parents. However, in reality only the children aged two and three could understand and express themselves in both German and Chinese. The five and seven- year-olds were not able to speak Chinese at all. The factors which led to this are explored in the following contexts. First of all, the societal factor was paramount. Since all the children attended the local kindergartens or schools, the German language dominated in their educational environment all the time. It indicated that the Chinese language must be scarcely used and the children had little chance to speak it in their schools or kindergartens. Besides, none of the five families sent their children to extra classes to practise their Chinese. Secondly, the parents´ ability to speak their partners´ language played an important role. Accordingly, only one of the German parents gained any basic knowledge of the Chinese language and was able to speak simple sentences. His little daughter aged three would love to correct his Chinese when she heard him make a mistake. This kind of domestic exercise could definitely encourage the child´s motivation to learn her parents´ languages in parallel, and in fact, the little one did it very well. Thirdly, the parents´ own viewpoints on bilingual education and whether they took any action to support their children also counted in this process. “I´d love to educate my children bilingually. But we are in Germany and I can hardly speak Chinese. So our three children speak little Chinese”, a German mother frankly explained the circumstances in her family. Similarly, Schwantes (2009) stressed the fact of the prestige of one language in bi-national families. This suggests that the natural environment of the language of the majority obviously has priority over the learning of the language of the parents. For children, this has an impact on their motivation to learn the less used language and it can easily be lost in consequence. What about the Chinese parents living in Germany? Unsurprisingly, the four mothers saw teaching the Chinese language as one of their parenting goals. Being fully aware of the priority of the German language in society, they felt strongly that they should talk to their children in their mother tongue only. They considered Chinese as part of their identities and the best way to introduce Chinese culture to their offspring. In other words, the four mothers put their determined efforts into their children´s bilingual education. Moreover, it would not completely satisfy them if their children could only speak the language without learning the Chinese characters. In practice, this meant that they often read Chinese books to their children, listened to Chinese songs and watched movies with their children. Moreover, they travelled back to China together regularly. At times, they also invited their parents, who normally could only speak Chinese, to come to Germany. With all kinds of efforts, the children got more and more familiar with the Chinese language. Compared with the mothers, the Chinese father was not strict in requiring his children to learn his mother tongue. In his opinion, “mother tongue was the language of the mothers”. He seemed to be happy that his children had already achieved this goal because all of them were fluent in German. Whether or not they were going to learn Chinese was not an urgent issue at the moment. Therefore, the level of his children’s Chinese was the lowest among the families in Germany. It should also be mentioned that two of the children were given German names only, because their Chinese mother did not think that her family name was suitable for her daughters. The other children had both German and Chinese names. Five German-Chinese families living in China also took part in the research. They lived in different cities, located in different Chinese provinces, all of the cities in which the families were living being regarded as multicultural societies: Beijing, Wuxi and Taicang. All the German and the Chinese parents as well as their ten children participated in the research. The children were aged from two to twelve years and all of them had both German and Chinese names, which was different from the case in the families in Germany. 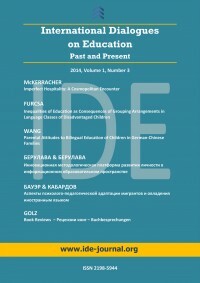 Basically, the German parents´ attitudes toward their children´s bilingual education were closely connected with their parenting goals. Unlike Chinese parents, who normally expect their children to get good marks at school (The extreme example would be the “tiger mother”), the German parents preferred a child-oriented style. Undoubtedly, this kind of mindset results from an historical as well as cultural background. “A glance at the historic-pedagogical publications of the first half of the 1990s indicates a new and rather impressively large trend in a revival of the discussion on a Reform Pedagogy (Progressive Education) in Germany. […] There are diverse “innovative” educational experiments which are all reform pedagogically motivated. They are designed to replace authoritarian teaching and receptive learning with forms of “open” instruction as well as promoting the self-regulations of pupils” (Golz, 1998, pp. 189f.). Despite the fact that none of the German parents could speak Chinese, (although they were living in China), nine of the children were equally proficient at these two languages, which presented a different situation from the children living in Germany. Those who were of school age had mastered the two languages even better. The only exception was the twelve-year-old boy, the oldest of the ten children, because he could only speak German. In comparison with the factors which influenced the families in Germany, two major aspects had great impacts on the families in China. Above all, the parents´ behaviour could create an encouraging atmosphere in which their children were willing to learn German and Chinese at the same time. One German father, for instance, valued the importance of managing these two languages and carefully undertook his “plan” from the first day of his child´s birth. In this family, no other languages were spoken to his child apart from German and Chinese although the couple had to communicate with each other in English. He even did not want his child´s Chinese grandmother to visit, only because she had a strong local accent. Furthermore, this father mentioned that learning English had replaced learning German in some German-Chinese families whom he had met because the parents thought that it would be more useful for their children in the future. Consequently, those children were rejected by the local German schools, simply due to their insufficient knowledge of the German language. Secondly, the type of educational institutions the children attended had a strong influence on their bilingual education, too. According to the four-year research, eight of the ten children attended educational institutions. Four of them went to the local Chinese schools. Three children were sent to bilingual kindergartens where Chinese and English were taught. One attended the German Embassy School, in which the German educational system prevailed and the German language dominated. The choice of the majority of the German parents indicated that they expected their children to have the opportunity to learn the Chinese language formally in local schools. Yet, the research also showed that this was simply a temporary decision because they expressed the desire to send their children back to Germany in the future. I felt she learned little in the foreign language school. Then I sent her to a local Chinese school. I was always unsure which one was more suitable for her. In the foreign language school, she could organize a music band and her character was open and active. There was no pressure to learn, but what they taught was too simple. Now back at a Chinese school, she has no time for making models of aeroplanes or other activities. What is taught there is pretty profound. Thus, it can be seen that the two models basically have a totally different educational philosophy. The Western-oriented institutions pay more attention to the development of children’s interests and strengths, the importance of which the Chinese educators have actually been aware for a long time, but have barely put into practice. By contrast, the traditionally Chinese school’s interests as a whole are still limited to the teaching of overwhelmingly large amounts of knowledge regardless of children’s comprehension. Deng (2007, p. 79) reports the results of a survey of Chinese children’s development from 2005. It shows that the time children at almost any grade needed for their assignments went far beyond the national regulations. Their time was mostly occupied by learning and they were no doubt overloaded. This author frankly points out that “the current reality which opposes the education of quality still truly and stubbornly exists” (p. 77). Accordingly, most of the Chinese parents in this research expressed the same feeling that these two models were extreme. Although such a situation frequently happened in China, most of the Chinese parents were of the opinion that the Chinese language symbolized the identities of their children. One of the mothers, for instance, decided to send her child to a local school saying “as a Chinese, she has to learn this language seriously”. My husband disagreed with sending our children to the local Chinese schools. I don’t like their teaching methods, either. The learning pressure on children in China has been increasing. The knowledge of grade one and two in primary schools is taught already in kindergartens. So, we’ll not send our children to the local Chinese schools. […] What I worry about is that the children’s Chinese language will be gradually lost after going to the German schools, as this language is hardly used there. They can only understand and speak Chinese, but are not able to read and write, because they will be completely dominated by the German language. So in my eyes, they are completely foreigners. In the future, there will be three Germans in the family, but only one Chinese, me. It’s my feeling. As a matter of fact, the issue of negotiating cultural values exists in almost every family relationship. No matter what the type of relationship is, e.g. mono-cultural, or bi-national, “good communication is perhaps the most essential ingredient in a successful marriage, and it is probably the most difficult to achieve” (Romano, 2001, p. 132). In the cases presented, in six of the ten German-Chinese families, the parents have to use English to communicate with each other. Even so, the majority of the ten sets of parents clearly expressed the wish that their children would grow up bilingually. Unfortunately, reality at times fell short of the theory, because not all the children in these ten families were equally proficient in Chinese and German. The three-year-old girl could speak these two languages and was able to correct her German father´s Chinese although she was one of the youngest in the research. By contrast, it was impossible for the twelve-year-old boy to express himself in Chinese. Besides, the three older boys, aged five, eleven and twelve, were left behind in the process of bilingual education as they could only speak German. It seems clear that this result reflected their parents´ preference for cultural values. “Parents´ educational and disciplinary styles depend a great deal on their value systems: on how they perceive their role in life and their relations with others and on their perception of the world and themselves. In other words, how they will instruct their children to behave will depend in part on whether their orientation is toward doing or being” (Romano, 2001, p. 118). Those Chinese parents who had studied and worked abroad were strongly influenced by the Western child-oriented parenting style. Accordingly, they preferred to see their children as individuals and would not force them to learn. It was no wonder that these parents had deeply-felt reservations about the unchanged contemporary climate of education in China: pressure to learn, competition for good grades, little time for questioning etc.. In short, obedience is expected of all the children in China. “A good child must listen to his parents and grandparents. He should not talk back. […] A good pupil must listen to the teacher and follow all the school regulations. In school, pupils learn the textbook by heart. No one is interested in their own needs. Children´s ability to think over with confidence is not supported” (cf. Wang, 2008, p. 202). As far as bilingual education is concerned, these Chinese parents insisted on their own style of parenting and did not consider learning Chinese as a must for their children, as long as they had managed their German well. Indeed, the three children who hardly had any knowledge of the Chinese language speak German fluently. However, this does not necessarily mean that these Chinese parents did not care about their children´s identities at all. On the contrary, they were proud of using their children´s Chinese names at family gatherings. They felt even happier that the members of their family were used to calling their children by their Chinese names as well, which dramatically symbolized the Chinese tradition of a child´s central position in the whole family. As to the German parents, all of them were aware of the necessity of bilingual education and wished that their children could speak Chinese as well as German, but their place of residence and the choice of their children´s educational institutions slowed down any progress they were making. Some German parents living in Germany, for instance, did not see learning Chinese as an urgent task for their children, since they attended the local schools, where German was the language of instruction. In addition, those German parents working and living in China had the opportunity to witness the local atmosphere of teaching and the customary way of raising children. Gradually, they determined to send their children to German schools in which the Chinese language had no place. To sum up, the research on the selected ten German-Chinese families serves as a mirror and indicates that the issue of bringing up children bilingually in bi-national families is not a question which people could simply adopt or not. In fact, it demonstrates a variety of economic, social, cultural and educational facets, e.g. place of residence of the family, parents´ educational backgrounds, decision about children´s educational institutions and even the role of the grandparents. Surely, it would be a great achievement if the children from these families had been using both their parents´ mother tongues since their childhood and could do it continuously. Does it mean that the others, e.g. the three boys, are the losers? I would say no. Learning is supposed to be a matter of happiness which has been universally agreed with. Language learning, therefore, should not be any exception. Based on the author´s personal experience of being able to speak German and Chinese, both languages is a positive experience. In fact, as far as the children from German-Chinese families are concerned, their ability mostly depends on their parents. The logical way, therefore, is to firstly arouse the parents´ interest in the culture of their partners, including their respective educational systems and teaching methods. Only if they develop an intrinsic interest in the other culture, is it reasonable to believe that they would encourage their children to learn the language and probably share the happiness together. In this respect, the current climate of teaching in China seems to have more “black clouds” to be cleared up. Chua, Amy (2010): Battle Hymn of the Tiger Mother. London et al. : Bloomsbury. Deng, Xi Quan (2007): 学习：喜中透忧 苦乐参半 (Learning: Half Happiness, Half Worries). In: Sun Yun Xiao & Sun Hong Yan (Eds. ): 儿童的名字是今天(Children’s Name is Today): 当代中国少年儿童发展状况蓝皮书(The Blue Book of the Contemporary Development of Chinese Children). Beijing: Science Publishing House, pp. 63-86. Falkner, Annika (2005): Binationale Familien in Deutschland – Chance für eine Gesellschaft auf dem Weg zur Multikulturalität. In: Fuhrer, Urs & Uslucan, Haci-Halil (Hrsg.) (2005): Familie, Akkulturation und Erziehung: Migration zwischen Eigen- und Fremdkultur. Stuttgart: Kohlhammer, pp. 172-186. Flemming, Christiansen & Liang, Xiu Jing (2007): Chinesische Restaurantbetreiber in den Niederlanden und in Deutschland seit dem Ende des Zweiten Weltkriegs. In: Bade, Klaus J. , Emmer, Pieter C., Lucassen, Leo & Oltmer, Jochen (Hrsg. ): Enzyklopädie Migration in Europa vom 17. Jahrhundert bis zur Gegenwart. Paderborn et al. : Ferdinand Schöningh, pp. 443-445. Fuhrer, Urs & Uslucan, Haci-Halil (2005): Immigration und Akkulturation als ein intergenerationales Familienprojekt: eine Einleitung. In: Fuhrer, Urs & Uslucan, Haci-Halil (Hrsg. ): Familie, Akkulturation und Erziehung: Migration zwischen Eigen- und Fremdkultur. Stuttgart: Kohlhammer, pp. 9-16. Geng, Jing (2008): 再分配体制的弱化 (Decrease in the System of Redistribution). In: Pan Shi Wei (Ed.) (2008): Series of Commemorating 30 Years’ Reform and Opening Up Policy – 中国社会生活的变迁(The Change of the Chinese Social Life). Beijing: Publishing House of Chinese Encyclopedia, pp. 202-285. Golz, Reinhard (1998): A Component of a Paradigmatic Shift in Education: The Renaissance of Reform Pedagogy (Progressive Education) in Central and Eastern Europe. In: Golz, Reinhard, Keck, Rudolf W. & Mayrhofer, Wolfgang (Hrsg. ): Humanisierung der Bildung: Jahrbuch 1998. Frankfurt am Main et al. : Peter Lang, pp. 189-206. Hernandez, Natalie Martinez (2008): Sorry, Schatz, aber ich verstehe nur Spanisch! In: Kumbier, Dagmar & Schulz von Thun, Fridemann (Hrsg. ): Interkulturelle Kommunikation: Methoden, Modelle, Beispiele. Hamburg: Rowohlt Verlag, pp. 131-150. Long, Ying Tai (2008): 孩子你慢慢来 (Child Slow Down Please). Shanghai: Publishing House of Wenhui. Luchtenberg, Sigrid (1997): Stages in Multicultural Theory and Practice in Germany. In: Watts, Richard J. & Smolicz, Jerzy J. (Eds. ): Cross Cultural Communication: Cultural Democracy and Ethnic Pluralism. Frankfurt am Main: Peter Lang, pp.125-148. O’Hearn, Claudine Chiawei (1998): Half Half: Writers on Growing up Biracial and Bicultural. New York: Pantheon. Qiu, Fa Zu (2006): 在德求学十年的点滴回忆 (The Ten-year Memories of Studying in Germany). In: Wan, Ming Kun & Tang Wie Cheng (Eds.) (2006): Spuren in Deutschland. Memoiren chinesischer Akademiker in Deutschland in den verschiedenen Zeitperioden des 20. Jahrhunderts. Beijing: Publishing House of Commercial Affairs, pp. 201-209. Romano, Dugan (2001): Intercultural Marriage: Promises & Pitfalls. London: Nicholas Brealey Publishing. Schwantes, Yi-Mei (2009): Bin ich Deutsch/r oder Taiwaner/in? Eine Studie zur kulturellen Identität von Kindern aus deutsch-taiwanesischen Familien. Münster et al. : Waxmann. Wang, Chong Jiong (2012): Negotiating Cultural Values in Bi-national Relationships: A Comparative Research on Children from German-Chinese Families. Unpublished Dissertation. Institute of Education: University of Magdeburg. Wang, Lei (2008): Wenn Konfuzius Schulz von Thun trifft… Kommunikationspsychologie aus Sicht einer Chinesin. In: Kumbier, Dagmar & Schulz von Thun, Fridemann (Hrsg. ): Interkulturelle Kommunikation: Methoden, Modelle, Beispiele. Hamburg: Rowohlt Verlag, pp. 187-205. Dr. Chong Jiong Wang, project manager in the Chinese Centre of Magdeburg, Germany. She did her PhD on Education at the Otto-von-Guericke University of Magdeburg.